Our Audience Measurement Service collects daily data on TV and Radio ratings, and last week we shared the performance of top TV channels in Ghana. Today we are looking at the summer TV ratings for Kenya. Survey respondents are able to pick the following top stations in Kenya: Citizen, KBC, KTN, NTV, K24, QTV, KissTV, Family, and GBS. GeoPoll also gives respondents the option to select “other” as the TV station they were watching, and manually type in a different station. 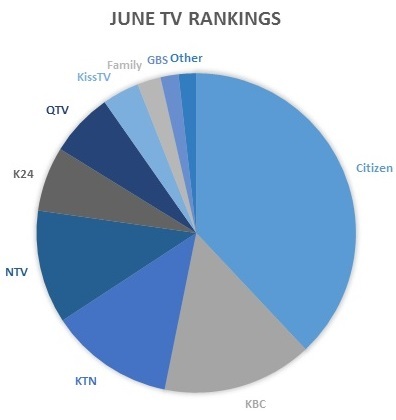 During the month of June, Citizen was a clear choice as the favorite station for Kenyans. Citizen had 1.414 billion total views during June. KBC was the second choice with 565 million views. KBC was the only station that had rights to air the World Cup games, which contributed to their high viewership. KTN and NTV were close to tying for third with only 42 million views between the two. For the month of July, Citizen was once again the clear favorite with 1.373 billion total viewers. With the World Cup winding down in July, KBC fell to fourth place while KTN and NTV rose above. KTN and NTV still remained close in total viewers. KTN saw its highest peak on July 9th with 18.912 million viewers throughout the day. Interestingly enough, KBC rose well above that with 19.753 million viewers, which was most likely due to the Netherlands vs. Argentina game that day. Looking at August, Citizen held on to their summer long lead as the top TV station in Kenya. They had 1.299 billion views that month. KBC fell to fifth place in August while K24 rose above it to fourth place. Want to learn more about our Audience Measurement service? Continue to read our blog where we regularly post insights from our data, and subscribe to our daily data service below.